Real Estate Networking Platform that Connects Real Estate Professionals. Connect with like-minded individuals looking to buy, sell and connect. Our platform puts the control back in the hands of the user by giving them direct access to other users who maybe interested in their property. Create immediate exposure for your property with our unique listing platform that also allows the user to receive analytics on how any particular property is performing. Schedule a showing for your property in just a few simple steps. Choose a date and time for the showing and our automatic scheduler does the rest. Directly market to your connections via SMS text messaging, maximizing the opportunity to reach buyers and sellers effectively. Utilize one of the best ways to promote real estate, by emailing your property directly to potential buyers and sellers. 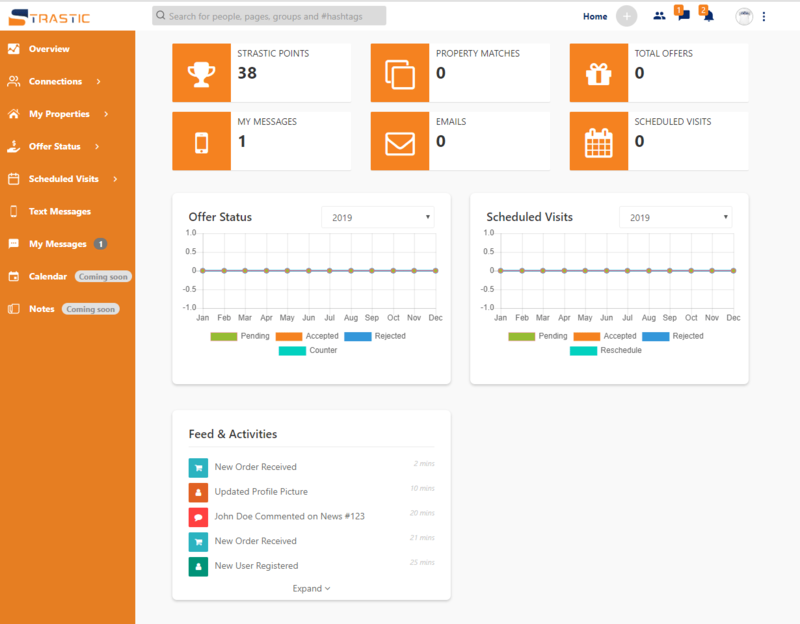 Use our interactive dashboard to keep track of your properties and interactions, while digging into your property analysis and other analytics about your scheduled visits, offers and connections. The cornerstone of our real estate platform is making connections. Strastic makes it simple to find and connect with buyers, sellers and other professionals. Copyright 2018-2019 | All rights reserved | Strastic Inc.